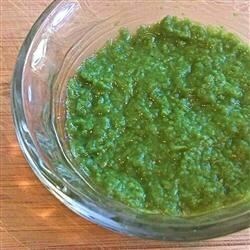 "This makes delicious baby food for older babies (broccoli may be difficult to digest for younger babies) or sneak it in your raw pasta sauces, burgers, or meatloaf to hide an extra dose of green veggies in your family's diet!" Place a steamer insert into a saucepan, and fill with water to just below the bottom of the steamer. Cover, and bring the water to a boil over high heat. Arrange the broccoli and swiss chard on the steamer, recover, and steam for 5 to 6 minutes depending on thickness. Add the peas, spinach, and garlic; continue to steam until the vegetables are tender, about 5 minutes more. Remove the vegetables from the steamer, and reserve 1/2 cup of the hot water. Place the vegetables, hot water, and lemon juice into a blender. Hold down the lid of the blender with a folded kitchen towel, and carefully start the blender, using a few quick pulses to get the vegetables moving before leaving it on to puree. Cool before serving, or divide the puree into four equal portions and freeze in resealable plastic bags for future use. The garlic adds a great favor to the sauces and meatloaf, but this is completely optional. I have heard that you can put green puree (without garlic) in brownies, but I have never tried this. This is a delicious recipe. I haven't made it with the ingredients called for except the broccoli. I've used broccoli, edemame, and kale. Umm! !